Installation; Why us? What sets our company apart from others. How does the billing work, keywords Net Metering, Net Electrical Metering, NEM, Time of use, TOU. By David Patsch, CEO / Founder of D P Door Company, Inc.
By using our established company you are not paying for the overhead expenses that other solar companies have. No sales commissions, no advertising expenses; you just pay for the installed solar electricity products and the related cost to design, install and time spent on your solar energy project. This is similar to wholesale prices, you're not paying the big markup other solar companies need to charge. D P Door Company, Inc has been given rates as low as 2.99% from HERO. We are authorized to give you 2.99% for 5 or 10 year term or up to 25 year also at a greatly discounted rate**. "You get more with DP DOOR." Installing solar with a poor design will not produce as much electricity. I spend many hours of calculations to provide the best output of the solar array. Resistance of DC power lines. Utilizing all above information to get you more power and lower utility bills. We constantly outperform other solar companies and can save you more money. Solar incentive coupon , instant savings no rebate needed. If you want a patio cover we offer Alumawood patio covers that are part of the solar electric power generator. Patio covers are a great way to cool your house and with solar panels they pay for them selves. Have you ever seen the solar tracking mounts that are used by often by use in some high end installations. The reason these devices keep the solar panels facing the sun is because the panels produce more power when facing the sun. Roof tops work well in most cases if they face the right "direction to the sun" (azimuth). Often there is not enough good roof area and some solar installation companies will install the solar panels in less then ideal locations. Using a patio cover can be an effective way to install the solar energy panels with a good azimuth. The insulated Alumawood Solar Patio cover is available for HERO financing at as low as 2.99% interest. Also you likely will get the Residential Energy Credits* (30% tax credit*). With the Alumawood patio cover we can utilize a better location for your solar panels. Thank you to Rooms & Covers for this picture of Solar panels on Alumawood patio cover. When you go solar you with D.P. Door we will help you to enroll in the utility companies Net Energy Metering (NEM) program. This allows you to get the most out of solar. My customers are in the SCE area so I will use Edison's info. What is NEM? NEM is a service that allows you to bank the power you make until you need it. They are charging more for high use of their electricity during that time. Unfortunately after 3pm, as the sun gets lower in the sky, so does the solar output. This new Time of Use NEM SCE rate plan is going though changes; please contact David at DP Door or Edison about current rate planes. This chart is of TOU-D-T, there are other plans that vary the peak times. Our solar photovoltaic systems are designed with solar panels that maximize power all day and extra emphasis on afternoon to 6 PM. Germany is the world leader in solar, I was trained from German solar engineering text books. They have 5 times as many solar panels on roof tops as we do. The German engineered Q-cell panels we use are one of the most popular in the leading solar continuers of Europe and number one in Japan. The Q cell solar panels have more power per watt. That may sound funny, because a watt is a watt. But there are STC watts and PTC watts. The PTC are tested in real world conditions, not in a 75 degree Fahrenheit lab. As the panels get hotter there is more resistance and the power suffers. The Q-cell only loses 10% while others , even ones that cost a lot more, lose 20%. Another thing that makes these a great choice is they work well in very low light. At only 200 lumens they still produce power. Not a lot of power cause that is relay dim, but more then most other companies. This means at 5pm to 6pm when other solar panels are shutting down these will still be pulling in power. Since this is the Souther California Edison (SCE) peak Time of Use (TOU) you could save or make almost twice as much. The new Net Energy Metering 2.0 (NEM 2.0) vs NEM 1.0 has only TOU billing. Where the old SCE NEM 1.0 had TOU or tiered domestic. Now time of use is very important, but even more important is time of generation. You got to make it to sell it at the higher rate. So I like panels and inverters that are going to keep putting out all day until the sun is gone not just low in the horizon. So how many panels did you get? It's not how many panels it is how many watts. 30- 200 watt panels is not as good as 20- 330 watt panels. Watts is what it is all about. Actually to go a step further AC watts to your house is what pay off your electric bill. And now with Net Energy Metering 2.0 (NEM 2.0) the time of day that the energy is produced and consumed (time of use, [TOU]) is also very important. The most common solar panels come in one of two sizes 60 cell and 72 cell. The cells are made of silicon the same material as computer chips. You've heard of "Silicon Valley" in San Francisco where the computer chips are made. Silicon comes from a laboratory grown ingot of crystals that are sliced into thin wafers. For solar cells Silicon converts sunlight into electricity. It will effectively do this for decades. It is not a proses like water into steam it is more like vibrations making music. The sun makes it vibrate on a molecular level and that agitation creates a current. Simply lay a wire across it and you can use that electricity for what ever you want. The current is direct current (DC) like batteries use but your house is Alternating Current (AC) because it is cheaper to run wires for AC. DC needs bigger thicker and more expensive wire. The DC goes through a thick wire to the Inverter. The inverter changes the DC to AC so you can use it in your house. The German engineered Hanwha Q-cell solar panels article on popularity in Europe and Japan. 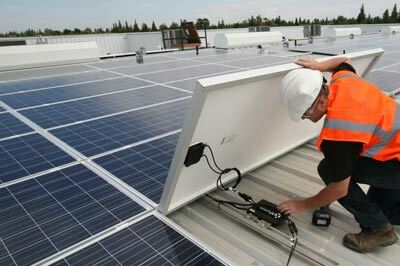 Many companies use micro-inverters. They save time in the installation but I don’t suggest them for the long haul. The inverter is the only complaint that is not likely to last 20 years. At some time they will need to be replaced. The warranties do not cover the labor, the labor for over micro inverters (under your solar panels on your roof) would be outrages. Instead of several micro inverters on your roof, I use one high quality Inverter. It will be installed in a location with easy access. Usually near your service panel. In 12 years It may need replacing, when it is on the wall it is very simple to do. 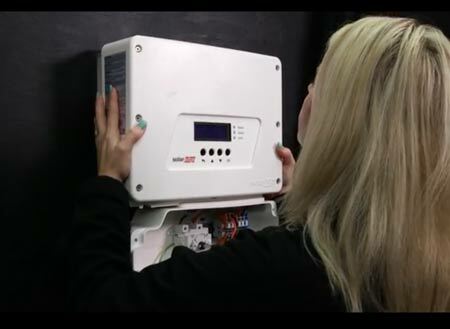 No one wants to have to replace things they bought but inverters are like computers, they keep getting better and less expensive. The technology will advanced so much in 12 years the new inverter will have the capability of produce even more power. A array of solar panels pumps out a lot of power. This means the inverter has to work hard converting thousands of watts of power to AC. Some power is loss because the inverter adds some resistance to the flow of the electricity. Every year or so the technology of the inverters improves and now a high quality inverter like the SolarEdge inverters have less resistance. If you want one inverter in a easy to service location and a record breaking efficiency use the SolarEdge HD series. A string inverter is about the size of a large shoe box. Just one inverter in a convenient location will handle most residential solar arrays. In 12 years but hopefully longer the inverter could become less efficient and need replacing. This is good and bad, it is bad because you have to replace it. It is good because like computers, every year they are improving inverters and a decade from now the will have even less resistance and will be able to do things to harmonize the solar panels to your house better then they do now. And like computers the prices are dropping significantly. What use to cost $8000 now cost $1500. The newer inverters pump more electrical power into your home even on cloudy days and when the sun is lower in the sky ( like after 3:30 PM). In a decade they will cost relatively less and will be even more efficient. So replacing it in 12 years can be a good thing. The labor charge to replace one of these inverters is a service call plus an hourly rate. The string inverter is usually installed in a convenient location. If it does wear out it is simple to unhook the old and use the same wires to hook up the new. Now lets say you decided to use micro inverters. Micro inverters save the solar contractor money when they first install your solar. The initial lower cost can cost thousands later. 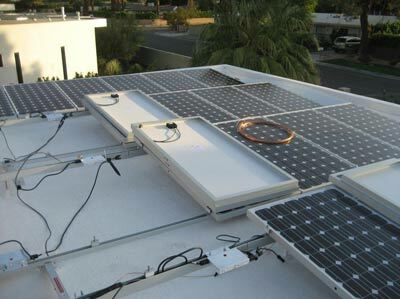 The micro inverters are attached to the underside of each and every solar panel on your roof. For one thing it gets very hot under a solar cell. It generates heat when working and its out in the sun which is solar heating it. Inverters do not last as long in this type of environment. Recently the manufactures are extending their warranty to 20 years and will give you a new or used one of the same age. micro inverter goes out, you have to pay an electrician to go on your roof and remove the solar panel that has the bad inverter. Hopefully he has identified the correct panel to remove and he can remove it with out removing too many other panels to get to it. Remember the clock is ticking, the long he or she works the more you pay. Also there is the service call charge. The electrician does not work for free, if he or she did they couldn't feed their family. The time to schedule your appointment, get the part to do the job, drive to the job and talk to you before setting up his ladder to climb on your roof is part of the service call charge. Hopefully he or she won't damage your roof each time he goes up to replace a micro inverter. If you have 30 solar panels you would have 30 micro inverters. The potential for you putting your electrician's kids through collage is something to think about. WARRANTIES ON LABOR; Just because your sales person thinks his or her company will cover labor doesn't mean they will. If a sales person says "don't worry we have a 20 year warranty", please read the fine print. Where does it say that if a micro inviter goes bad that they will pay for the labor? Even if the sales person says they do, or hand writes it on the proposal, he may have been given bad information from a over zealous sales manager. Please get a copy of the actual contract and look for the word "labor". if they say the manufacture covers labor, please do your due diligence You can download the manufactories's warranty and look for the "labor" word. The sign contract supersedes promises from the sales person. Your monthly bill from Edison. You would still have fees to pay (about $17 to $25 a month to Edison) . Souther California Edison SCE is starting a new net energy metering program. There are many of the features of the old NEM 1.0 but Solar Electricity users will need to use "Time of Use" pricing and will not have the option for the traditional tier pricing structure. Also there are some fees that NEM 1.0 did not have. If your solar installer knows how to build a system to maximize your solar electricity production in the right way, you can use Time Of Use (TOU) to your advantage. I have painstakingly written a computer program to run scenarios of solar panel installation and inverter ranges to maximise our systems for the new NEM 2.0 TOU from SCE. 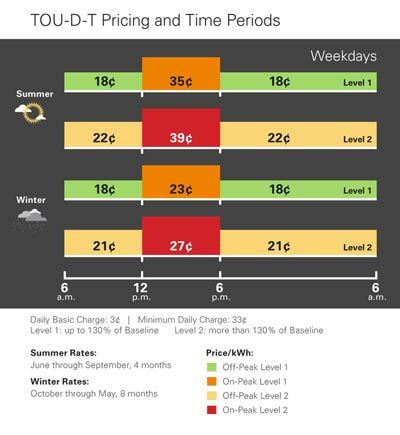 There are 8 price levels, all base on amount of electricity used during different times in different seasons. With a large systems, with a pool pump and or water features, there can be hundreds of dollars a month difference. In a nutshell the idea is to BUY LOW & SELL HIGH. You could produce solar and be credited by SCE at a peak rate. Then use more power then you produce at the lower rate. This is similar to buying a larger and more expensive solar electric system, (you get more electricity to use) only with out the cost of buying more solar panels. It is done with knowledge not more materials. If not done correctly it could have he opposite effect and you would be wasting electrical power and money. We have all had sales people promise us things that sound great but when all is said and done (and paid for) we did not end up with what we wanted. And the little surprises that we agree on even though the sales person neglected to warn us about. Some things that we buy come with pages of jargon. We trust the sales person to explain what is on the agreement only to find out they didn't’t understand it either. We have seen adds for cars at only $150 a month or at a attractive low price. But what we end up with is total different. When it comes to solar there is are many things to consider and we have to trust the person we hire to deliver. We all know solar electricity is made from solar panels but that is only one element of what is important to know. 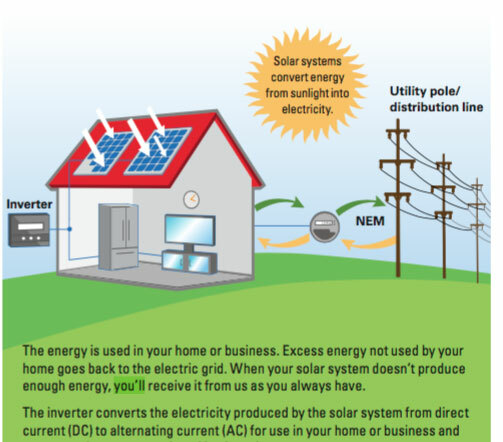 Solar electricity is for your home is confusing because it is not just an improvement it is a financial investment. You want to know how long until it pays for it's self. The return on investment (ROI) is a common concern experienced investors. Unfortunately most investment advisors don’t understand the ins and outs of solar, and most solar sales people are not experienced at large investments. There are many variables to consider when thinking about solar. Some sales people just want to make a sale, they may skew things a bit. Tax credits are usually shown on your estimate and contract listed as “your expected tax credit” . This IRS tax credit is for real; the 30% credit is based on the price of the photovoltaic system (solar project). Some sales people miss understand how the credit works. They seem to think you get this solar incentive based on the quoted price before so called discounts and or manufacture's rebates. The IRS gives you a 30% tax credit* on what you spend for the photovoltaic (PV) system and all related work. But you have to subtract the rebate from the price, then multiply it by 30% to find your credit*. I	t would be nice if the sales company could inflate the price and the IRS gave you 30% back on that exaggerated price. But the IRS is not that foolish. If you are promised a rebate then that rebate needs to come off the total price before calculating the 30 percent tax credit. If you don’t you will owe the IRS a lot of money and a penalty. The sales companies may even imply that the IRS won’t know about the rebate. As a business man I can tell you that the company selling to you is not likely to keep it a secret, if they did it would show as additional profit for that business and that business would have to pay taxes on it. When the business shows they sent you a rebate for thousands of dollars they may send a 1099 to the IRS and you will be paying taxes on it. Not only will you pay taxes but also penalties for not claiming the rebate and for getting an energy incentive for more then you should have. It is the bottom line out of pocket that is used in the solar incentive tax credit. Use IRS Form 5695, Residential Energy Credits, to claim these credits. I have also seen proposals that show a great payment plan, but due to a “math err” they miss calculated the payments by 50%. They actually show on the estimate that your payments would be x amount per month for 5 years at x percent interest and it would pay off the system. But actually the financing contract comes back at double the amount. Another thing about sales tactics with loans is they may offer a very low interest rate. Unsecured loans are usually 7 to 14 percent. The rates they offer may be 2.99% and sound enticing but the price of the Photovoltaic system may have been increased to cover the low interest financing. You may be paying thousands more for the PV system then what D.P. Door Company, Inc. charges. If you talk to a sales person about leasing most likely they won't give you all the details. A typical 20 or 25 year lease that compounds at 2.9% will tripe the cost of the PV system. It is not like a loan where you pay it off early and you don’t have to pay the interest. You owe all of it from day one; 20 years of payments. Since most lessees compound at 2.5 to 2.9% annually, those payments eventually double. So you owe a whole lot of money the day you sign and for decades to come. You are responsible to make sure the leasing company gets every payment even if you move unless the new buyer takes the lease. It is not just up to the new buyer it also depends on if the leasing company approves the new homeowner. Keep in mind leasing is not like financing, the payments go up every year and there is almost no way to get out except to pay off all 25year. A PV system that produces $150 or electricity cost $14,000 from D.P. Door Company, Inc. If you lease a system that size you might pay $100 a month. At 2.9% compounding a year, your payments will double at 25 years. Including increases. That works out to over $40,000 you owe them the day you sign. Over 25 years time the PV system would produce about $45,000 of power at today's rates or $65,000 if it goes up a little more then the Fed’s target of 2.5% /year inflation. With D.P. Door Company, Inc. you would produce the same amount but instead of paying $40000 you would pay $14000. If you decide to finance it through dp door Using the HERO program, you would low less then the original amount and your payments never go up. So if you move in 10 years you would owe half as much using D.P. Door Company, Inc. as you would with a lease. AMONG MOST POPULAR IN EUROPE #1 in JAPAN. ...Now the German-headquartered PV solutions specialist achieved growing revenues and positive earnings before interests and tax (EBIT) in the first three months of 2014. Moreover Hanwha Q Cells has taken the lead among European PV companies with total shipments of 247MW and a module production volume of 244MW in Q1 2014. The company has gained further market share in its European home markets and in its single largest market, Japan. In Europe the United Kingdom is an especially important market for the company followed by France and Germany. At the same time Hanwha Q Cells Japan has reached the position as the leading foreign PV provider in Japan, the company reports. Moreover, Hanwha Q Cells has been expanding its power plant solutions business. On the basis of the company's track record of around 700MW of installed capacity in large scale power plants Hanwha Q Cells has realized projects in the Europe, the Americas and Asia. Any offers expire 30days after posting or as by by expiration date shown on specials. Expired offers are not valid. *Most homeowners with an income qualify for tax deduction but always check with your tax expert. ***D P Door Company, Inc is a preferred HERO contractor and receives a special greatly discounted rate that we pass along to our customers. This financing is only for projects that reduce pollution and green house gasses. It is sponsored/indorsed but not funded by local governments; Qualifying is much easier then most financing. last updated July 9, 2017. Offers and claims change over time. Copyright D.P. Door Company, Inc. all rights reserved. Solar 909 is a trademark of D.P. Door Company, inc.